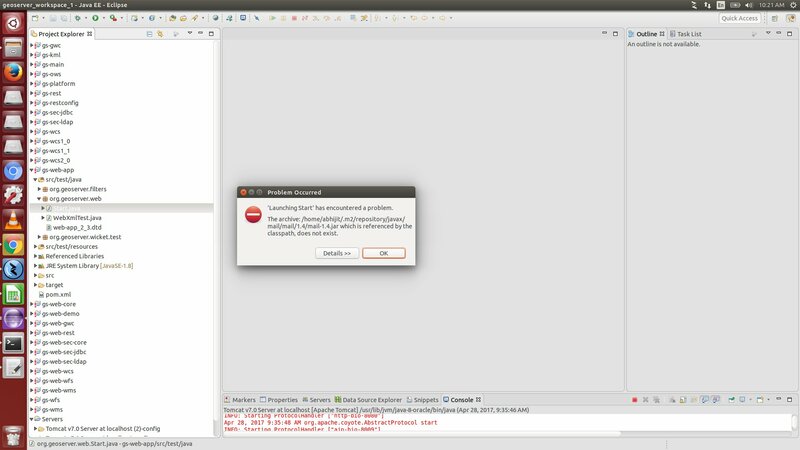 I am able to download geoserver source code , build it with maven , create maven eclipse project but when i load the project from /src in the eclipse it does not run. after checking build path i found that M2_REPO structure is not as what the build path is expecting. Apache Maven 3.3.9 (bb52d8502b132ec0a5a3f4c09453c07478323dc5; 2015-11-10T22:11:47+05:30) Maven home: /usr/share/maven3 Java version: 1.8.0_121, vendor: Oracle Corporation Java home: /usr/lib/jvm/java-8-oracle/jre Default locale: en_US, platform encoding: UTF-8 OS name: "linux", version: "4.4.0-72-generic", arch: "amd64", family: "unix"
Browse other questions tagged geoserver ubuntu eclipse ubuntugis maven or ask your own question. How to install GeoServer on Ubuntu 11.10 64 bit?